Andre Hahn (r.) celebrates his winning goal. At around 17:20CEST on Saturday afternoon, the home fans in attendance at the BORUSSIA-PARK could have been forgiven for thinking that life was pretty much perfect. 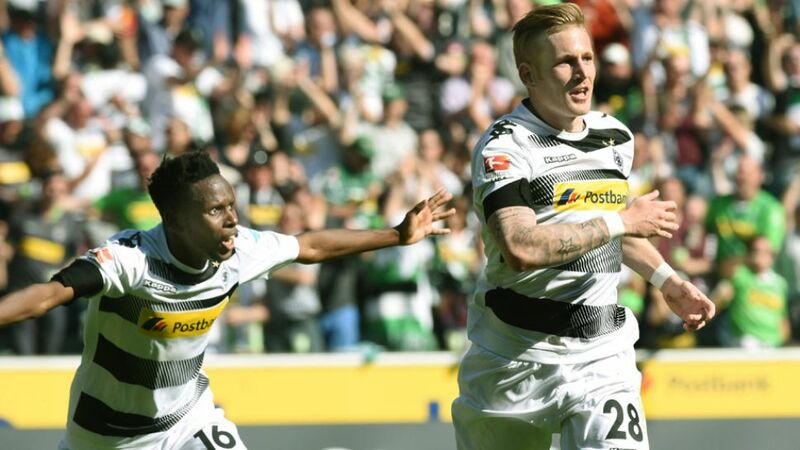 The sun was shining, Borussia Mönchengladbach had just beaten Bayer 04 Leverkusen 2-1 to all but secure qualification for next season’s UEFA Champions League, and emotional, heartfelt farewells were being paid to long-time servants Martin Stranzl, Roel Brouwers and Havard Nordtveit. It had, however, looked rather different earlier in the afternoon. When Charles Aranguiz latched onto Javier 'Chicharito' Hernandez’s pass, exposing the gaps in the hosts' defence and putting Leverkusen ahead after 20 minutes, Gladbach fans, who have been subjected to a rollercoaster ride this season, may have feared the worst. Andre Hahn's fine brace, though, turned the game on its head, inspiring his side to a result that means only a nine-goal swing next weekend will prevent the Foals competing at Europe's top table for the second season in succession. That itself is quite an achievement for a side that lost the first five games of the season, only scoring two goals in the process.